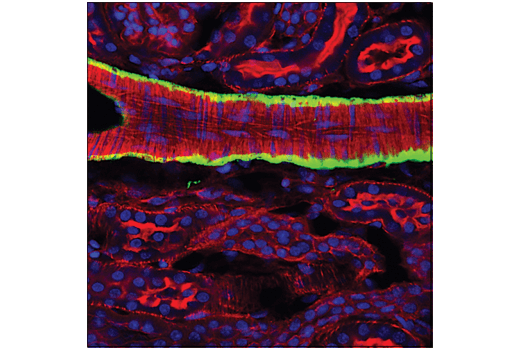 Confocal immunofluorescent analysis of a blood vessel in mouse kidney using α-Smooth Muscle Actin (1A4) Mouse mAb (Alexa Fluor® 488 Conjugate) (green). Actin filaments were labeled with DyLight™ 554 Phalloidin #13054 (red). Blue pseudocolor = DRAQ5® #4084 (fluorescent DNA dye). α-Smooth Muscle Actin (1A4) Mouse mAb (Alexa Fluor® 488 Conjugate) recognizes endogenous levels of total α-smooth muscle actin protein. Monoclonal antibody is produced by immunizing animals with a synthetic peptide corresponding to residues near the amino terminus of human α-smooth muscle protein. This Cell Signaling Technology antibody is conjugated to Alexa Fluor® 488 fluorescent dye and tested in-house for direct immuno fluorescence analysis in human cells. This antibody is expected to exhibit the same species cross-reactivity as the unconjugated α-Smooth Muscle Actin (1A4) Mouse mAb #56856. Actin proteins are major components of the eukaryotic cytoskeleton. At least six vertebrate actin isoforms have been identified. The cytoplasmic β- and γ-actin proteins are referred to as “non-muscle” actin proteins as they are predominantly expressed in non-muscle cells where they control cell structure and motility (1). The α-cardiac and α-skeletal actin proteins are expressed in striated cardiac and skeletal muscles, respectively. The smooth muscle α-actin and γ-actin proteins are found primarily in vascular smooth muscle and enteric smooth muscle, respectively. The α-smooth muscle actin (ACTA2) is also known as aortic smooth muscle actin. These actin isoforms regulate the contractile potential of muscle cells (1).